Jan welcomed us, encouraging us all to praise God and give thanks in song. We love singing and it is amazing how much it adds to our ability to say what we want to say to God. How lovely is your dwelling place, O Lord of hosts. My soul longs, indeed it faints for the courts of the Lord. Hymn TIS 143 ‘Immortal, invisible God only wise’ Praise for God's unending ability to be, leaving us confident that we can turn to him at all times. Jan led us, acknowledging our God's otherness and asking that we recognize his presence, guiding and inspiring us, gifting us with purity and humility of heart. We long to be more like Jesus and so asked for the Holy Spirit to fill us with God's grace and goodness. Prayer of Confession A prayer to Jesus, who is true wisdom, to forgive us our foolishness for putting our trust in false treasure. Jan, on our behalf, asked for forgiveness, that through the work of the Holy Spirit we will know true joy. Words of assurance Because Jesus gave his life for us we are invited to "Accept Christ's gracious gift to live freely, joyously and wisely. Thanks be to God. We were reminded of the words of Jesus Christ to "Go therefore and make disciples of all nations, baptizing them in the name of the Father, and of the Son and of the Holy Spirit, teaching them to observe all that I have commanded you: and lo, I am with you always, to the close of the age." Matt. 28: 18-20. Jan then explained the meaning of Baptism and asked those present to declare their belief. When Arthur had been Baptized the congregation sang the Aaronic blessing to him, wishing him all of God's blessings as long as he lives. "May the Lord bless you and keep you. May the Lord make his face to shine upon you and be gracious unto you. May the Lord lift up his countenance upon you and give you peace." 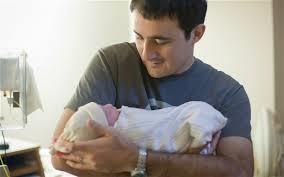 Alan cradled Arthur in his arms as he brought him to meet each one of the congregation, so that we could personally welcome Arthur into the fold. Jan then asked us, each in our own role to promise to sustain Arthur in his Christian life. "Arthur, you belong to Christ, the light of the world. May you always walk as a child of the light. Let your light shine before the world, that all may see your good works and give glory to our Father who is in heaven." Matt. 5: 16. HymnTIS 491 “Father welcomes all his children” Jesus made it clear that children are so very welcome and we should ensure that they understand this through our actions towards them. Offering We worshipped God with our material offering, giving back just a little of his blessings to us. Bible Readings- ​ Grahame Forrest: Psalm 84 The psalmist is displaying a knowledge of and appreciation for his relationship with God. On our better days, when we aren't resisting God's call, we experience this same happiness. ​​​Ephesians 4:25-5:2 A clear lesson in how to behave as Christians. How much better this world would be if everyone could behave like this. Think of the damage done by enmities between individuals, communities and nations where nobody is really sure where it all started. A total waste. Sermon- ‘Live together in love’ Dan spoke, inviting us to think about the way we conduct ourselves and the excuses we give for our not-so-attractive habits. Pointing to Paul's letter to the Ephesians, Dan focussed on the way we should conduct our Christian lives, especially in the light of what Christ has done for us and passed on Paul's plea that we "Do not grieve the Holy Spirit of God." Dan drew our attention to our roots, in our family, community, friends and church. Dan asked us to look at what Paul had to say about being part of the church. We are told to relate to one another in a way that reflects God's will: we are told to speak the truth, even when that is not easy and we need to be sensitive about it. We are told to avoid anger but that it is a proper reaction in the face of injustice, violence and neglect. We are to support ourselves financially and give to others, both materially and with our time and effort. We should be careful about our speech that we do not hurt others or cause division. Especially within the church, we should resolve conflicts and be kind and tender-hearted towards each other. We should stop and listen, to be aware of the work of the Holy Spirit in our lives and follow his guidance, sharing his love with others. Hymn TIS 209 ‘And can it be that I should gain’ It’s because we are loved. We are lifted out of the mess of this world because God loves us and reaches out to us. It is a mystery how that has turned our lives around...totally. Musical interlude. During this time we prayed silently, holding up our personal concerns before God. Prayers of Intercession Margaret prayed, thanking God for the life he gives us, as babies and as we look to him for eternal life. She thanked God for his generosity in reaching out to us, inviting us into the blessings of his Kingdom. Thanks were given for parents everywhere and support was offered to all families. Margaret led us, holding up those in our Congregation who have lost loved ones asking for our Father's support. She prayed for leaders, political and religious, that they will be given wisdom and grace, to lead us wisely and compassionately. Hymn TIS 47 ‘Our God our help in ages past’ God walks beside us, guiding and protecting us, sometimes carrying us, as he has forever, for all who accept him. It is reassuring to know we are not alone as we live our lives in what are often difficult times. And the blessing of God Almighty, the Father, the Son and the Holy Spirit be upon you and remain with you always. Amen. Hymn TIS 778 ‘Shalom to you now, shalom my friend.’ Every good wish and every blessing of God to you all. Here is the church, here is the steeple, open the doors and see all the people. Richie used this simple children's rhyme to introduce the ways people have thought about the church. Hymn TIS 132 "Holy, holy, holy! Lord God almighty" This hymn is a favourite of mine. Some insightful person has given us the words we need to praise our God with full hearts. Richie reflected on our need to praise God and confess our sins to him so as to accept forgiveness. We need to acknowledge our part in this fallen humanity. We may not actually do individual evil things but we support a system where real evil happens even if we do not intend it. in the wrong we have done, and in the good we have not done. we have sinned through our own deliberate fault. We repent and turn to you. Forgive us, for our Saviour Christ’s sake, and renew our lives to the glory of your name. Amen. …hear then Christ’s word of grace to us: “Your sins are forgiven” Thanks be to God. Even having taken part in this part of the service, how hard is it to accept forgiveness? That thought is worth looking at. Have we not truly repented? Or do we think we are so bad that we can't be forgiven? If the latter, then be reminded that forgiveness is not earned, it is a free gift. Hymn TIS 217 "Love divine all loves excelling" A plea for God to come down; to enter our lives and bless us; changing us into the people we can be. Bible Readings Mark 9:38-50: The disciples were upset because people unknown to them were performing miracles in Christ's name. Jesus' reply, "whoever is not against us is for us" is a simple lesson in tolerance and perhaps an acknowledgement that even people who do not profess faith in God can do his work. Further, Jesus makes it very clear that we should be very careful of putting impediments before others for any reason. Ephesians 4:1-16. Another lesson in tolerance - "be humble, gentle; be patient, bearing with one another in love...keep unity...bond of peace." We have been given the gifts to operate in this way so we should take hold of these gifts so that God's kingdom will flourish. Sermon: All for one, one for all Richie began by speaking again about the children's rhyme with the elements of church, steeple and people. As church buildings grew from being merely functional to be an ornate tribute to God and his people, they became larger. Height was added using a steeple, making some cathedrals the tallest man-made structures in existence...until the construction of the Eiffel Tower. However, more recently the focus is on the people. We, the congregation are the church. Further, the model of church is changing. Meetings in schools, pubs, cafes are all ways of being church. Which groups can we think of as church: our local congregation? Our denomination? Denominations with similar theology? The 'universal church'? Richie's take was: "All who follow Jesus, all around the world. Yes we're the church together." But "following" is just not "having an interest in". "Another way we typically look at the church is to say that it is the body of Christ." Christ is the foundation....the cornerstone...Christ is the head of the Church. In Ephesians "Paul begins by urging the Ephesians to live a life worthy of the calling they have received". We need to act in humble, gentle and patient ways. But Paul said more: "There is one body and one spirit...one Lord, one faith, one Baptism, one God and Father of all." But we need to be careful how we act as one. Richie spoke about gifts but then nailed it: "And it is by love that Christians are to be known." (John 13: 34 - 35). There was more but because of space, I think this is a fine note to stop on. 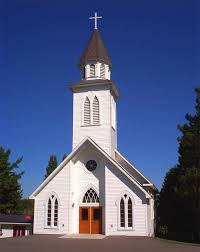 Hymn TIS 457 "The church’s one foundation is Jesus Christ her Lord" We are the church. Through divisions, uncertainty, heresies and all the rest, we are God's church and he will continue to guide us and bless us. Musical meditation We considered our own need to turn to God. A meditation on Ecclesiastes 3:1-8, and how God is present in all the phases of our lives. 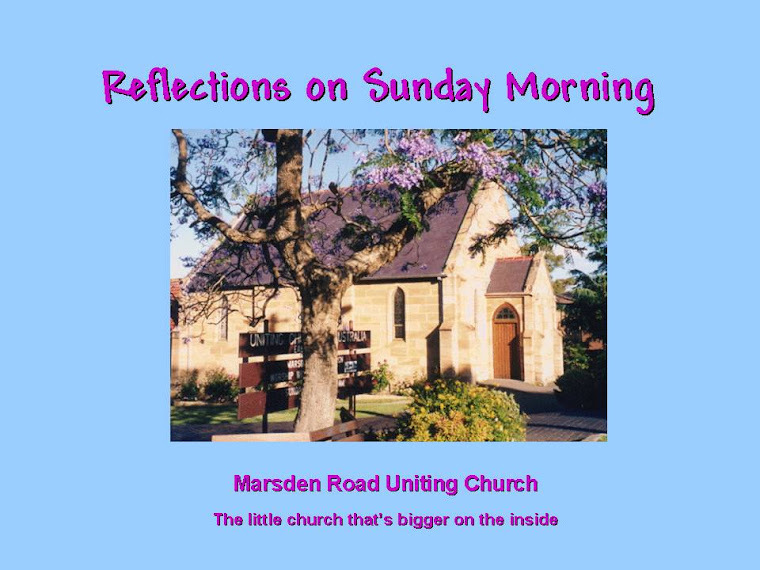 This reading speaks of there being a time for all things and within our little community here at Marsden Road, at the moment, we are experiencing many of those. Richie prayed for each of the people who were named by members of the Congregation as well as lifting up those in the community not known to us personally. …who lives and reigns with you in the unity of the Holy Spirit, and who taught us to pray: we then joined in the Lord's Prayer. Hymn: Onward, Christian soldiers Not so much in the martial sense but in the sense of being one unit, striving for a cause that's beyond anyone of us. As God has called us, let us live up to our calling. Let us be humble always and gentle and patient too. Let us be forbearing with one another and charitable. Let us spare no effort to make fast with bonds of peace the unity which the Spirit gives. There is one body and one Spirit, as there is also one hope held out in God’s call to us; one Lord, one faith, one baptism; one God and Father of all who is over all and through all and in all. And know that we go out from here, into the world and into the week, with the blessing of God almighty: Father, Son and Holy Spirit. Amen. Call to Worship: The earth is the Lord’s and all that is in it. The world and those who live in it. He has founded it on the seas, And established it on the rivers. I wait for the Lord, my soul waits And in his word I hope. This hymn, with words written by St. Francis of Assisi and translated 400 years later by William Draper is based on Psalm 69:34; “Let Heaven and earth praise Him, the seas and all that move in them.” It is always a joy to begin our Sunday morning with such praise and poetry to awaken our minds to God’s abundant gifts. Prayers of Praise and Thanksgiving: Jan built on this feeling by addressing God; “Dear Creator God, God of light and love” and by thanking God for his magnificent creation and opening our eyes and hearts to God’s light and love so we may become people who radiate God’s love to the world. Prayers of Confession & Words of Assurance: Through Jan we confessed that we often choose the easy and non-threatening way and sometimes listen to the media’s truth, allow evil to triumph and lose our way. Jan prayed for forgiveness when we do not follow God’s way and listen to His voice or bear witness to His love and life. As always we were overwhelmed by the gift of God’s Grace as our sins were forgiven. Children’s Message: Jan read a story by Peter Thamm, about the “Legless egghead green fluffy-haired monster” which lived in his back yard. I smiled as I watched the fascinated children and thought about when I went to Sunday School. Certainly there were no lovable “monsters” in the stories we heard about Heaven and about Jesus being our friend. Offering / Prayer: The offering for God’s work, was taken up by Carolyn and Colin, with help from the children; before they went with Laurel and Ruth to Sunday Kids with a special Blessing. This Charles Wesley Hymn of Praise is quite short yet it also encompasses, Grace, seeking God’s presence, encouragement and “glorious hope” and anticipation of eternal life. All this in just 12 lines and 3 verses! Margaret’s sermon about CREATION was - all about God and this impressed me on several levels. Yes the photos she showed of some of God’s most awesome work like Mt. Everest, the Challenger Deep, the gigantic Coast Redwood trees and the tiny molecules in our bodies, all reminded me that I have often wondered how anyone can look at these things and wonder if there is a God. I have often looked and smiled as I acknowledge that God must have a sense of humour! What diversity and what incredible ways he has addressed the needs of his creatures to overcome their peculiar needs and address their interdependence. Margaret said; “If we extend our appreciation of God's handiwork across the whole planet, we begin to see the webs of life, the pyramids of one form of life depending on another, the cycles of materials through both living and non-living things. Brilliant! But over the centuries, humans have not baulked at misusing and trampling this creation as though it was theirs and is ours to treat as we wish. And.....as though it was and is infinitely renewable.” She then talked of the way people, including Christians, have often presumed us to “have dominion over the rest of creation” without realizing our responsibility to use this in a God-like way without causing destruction while suiting our own needs. “I taught the theory of evolution as most people would have heard about it, and with the proviso that goes with any theory – that is that adjustments may be necessary in the future as new information comes to light. One piece of information that's not new but has been neglected is that co-operation as well as competition is involved in evolution. I also believed what is written in Genesis 1 and 2 and all the other references in the bible to creation. That is still my position – because I believe the evidence supports the theory of evolution and I see it continuing around me and I believe the many references in the bible to creation. I believe they are not about the technicalities of how the Earth and the life on it came into being - but always about God. About God who is love and who created all that exists out of that love. The authors in the bible were always writing about God. The story of Noah isn't about Noah, it's about God. The stories of David are not about David. They are about God. The story of Paul's conversion is about God.” This part I really liked – how many people do we all know who want to turn everything around and make it about themselves? We could do well to always try to remember that what happens to us is often because we were not thinking about God and God’s way. In talking about Scientists Margaret said; “God is the author of everything studied in science, he gave reason to the people who ended up being called scientists, to work out the rules and systems that he, God, in the beginning, instituted. We seem to accept this better in the area of medicine. We don't have as much trouble accepting that God works through doctors and nurses. What is to be noted here most strongly, and this is true of the Genesis stories as well, is God's creative power. This creative power is more than a force that produces matter or things made of matter. God's creative power brings light in the darkness.” Margaret then quoted John 1:4-5 "And the light was the light of all people. The light shines in the darkness and the darkness has not overcome it." She went on; “It is this light that raises creation above mere bits and pieces of mineral and living tissue. In Jeremiah we hear that this light can make those who trust in God like "trees planted by water, sending out their roots by the stream." These trees will always stay green, fed by God and they will bear fruit. They will always be illuminated by God's light. Colossians says that "in him all things hold together". It is his light that creates a Church out of very ordinary people, when their trust is in him. And what happens when this light illuminates the soul of a person? Someone like John the Baptist is created, not only calling the world's attention to the coming of its Saviour but also giving us a template for the lives we are to live. Lives that bear fruit as is written in Jeremiah. Lives that are reconciled to God and who are held together in the Church as in Colossians. Lives that are proclaimers of the Light, telling, by our lives that "From his fullness we have all received grace upon grace". Have you noticed that we have moved from God's power in creation to his power in transforming our lives?” Yes! It is all about God Margaret – but as always the hard part is - it is all up to us to live our own lives with that in mind! Christ, be our light! Shine in our hearts. … Shine in your church gathered today. Prayers of the People: Jan lead these prayers for us today; “We are blessed by the God and Father of our Lord Jesus Christ, who has blessed us in Christ with every spiritual blessing. Touch our hearts O God, with your love for all the world, so that we are filled with new ideas and renewed faith, which brings hope about how the world can be changed. Remind us Lord, of ways in which, as individuals, we can care for your creation and ways that together we can protect the goodness of the earth that you have placed us in, and of which you have made us stewards. We thank you for Jesus the Word, the Light who shines God’s light into the dark places of our lives and of our world. Bring sight and faith, where there is doubt and fear. Bring comfort and strength where there is sadness and a sense of tiredness to go forward.” Jan prayed for the special needs in our red prayer books. Then we shared together in the words of the Lord’s Prayer. Edward Hayes Plumptre, 1821-1891 was an important and influential theologian of his time. I love the positive and simple faith expressed in this hymn – God is in control! Strength for every endeavour. Amen.